World Masters Athletics yesterday announced its annual IAAF/WMA Best Masters Athletes of the Year. It was easy as ABC. A is for Allie, B is for Bortignon and C is for Charles and Christa — whose slew of world records and world titles made them slam dunks in 2013. At Porto Alegre, M65 Charles Allie won individual golds in the 100 (12.55), 200 (25.00) and 400 (56.60) by astonishing margins of 0.64, 2.32 and 7.85 seconds, respectively. He smashed WRs in the 200 and 400 this year, ending up with amazing marks of 24.65 and 56.09. His 25.41 at Landover nationals also was an indoor WR. 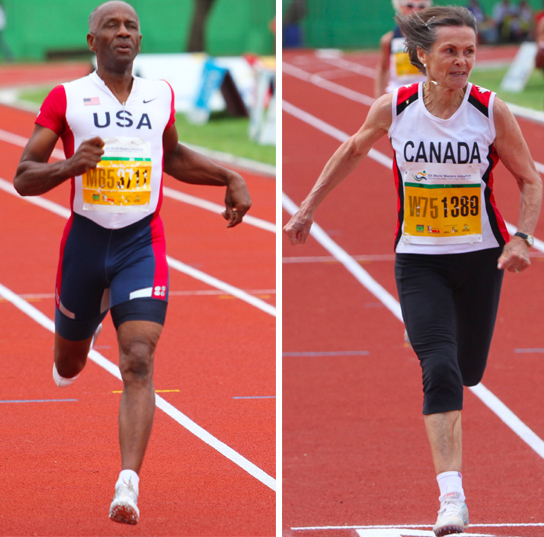 Canadian W75 Christa Bortignon added to her 2012 world-record spree in 2013 when, at age 76, she won eight golds at Brazil worlds in the sprints, hurdles and jumps. But her best marks may have been in the heptathlon. First she scored 6293 points at a German meet, then 6519 at the World Masters Games in Italy, boosting the pre-2013 record by 1,100 points. Charles is the fifth American to win a trip to the IAAF World Athletics Gala (which will be Nov. 16 in Monaco this year). 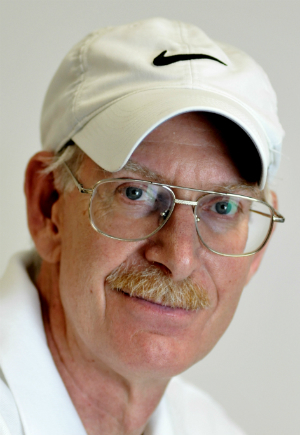 Earlier winners were Bill Collins (2006), Phil Raschker (2007), Rita Hanscom (2009) and Bob Lida (2012). Only Australia (with six picks) has more. Congratulations to both very deserving winners! I was sitting here at work this afternoon looking for something to cheer my spirits up as I continue my long road to recovery from two foot surgeries from a week ago. This posting on the BEST MASTERS ATHLETES OF THE YEAR has absolutely accomplished this me today. Charles, what an honor to have run multiple 4×400 American and World Record Relay teams with you, Bill C., and George H. over the last few years, including this year’s M60 Indoor and Outdoor records! You are an inspiration to me my friend, both on and off the track! Charlie is most deserving, he is a great alhlete and person – congratulations ! Mr. Allie, It is people like you who inspire me to keep running whenever I think about hanging up my spikes. H.U. Alumni Magazine must be notified of your amazing accomplishments. A brilliant effort at the World Titles Charles to top off a series of extraordinary performances this year. you are a truly deserving winner.I would have loved to be in all of those races with you. I’m very happy for Charles. He has ALWAYS been a great sprinter and has always been overlooked. I’m glad he is finally getting this honor. convince me to run and i’m glad i did.Love you man!!! Charles, my great friend and teammate. As we talked all year long about this and you took the bull by the horns and went for it in every race you ran, and now the results of your work has happened. I have never been more proud of one person. We have spent many days and nights together, the support we have for each other is like brothers. You and Jackie are family and always will be. Stephanie and I send you both blessings for a wonderful trip along with an honor that is long over due. Charlie, you are brilliant and unbeatable on the track, and this recognition is overdue. As great as you are on the track, it is who are off the track that has always made a lasting impression on Kathleen and myself. Your and Jackie’s friendship is treasured, and I am blessed to know you and have run so many relays with you. I trust you and Jackie will have a wonderful trip. Enjoy it these days, and by all means, carry on running at your unbeatable “One-Speed”. It’s people like Charlie who keep me involved in masters track. Never met a finer, more gracious person — which is just as important as his on the track performance. He’ll be representing all of us in Morocco, and we couldn’t ask for anyone better. Congratulations Charlie. It’s great to see nice people get what they deserve. Truly amazing, Mr. Allie! You are an inspiration to so many. Congratulations!!! Glad to see that Charlie won this award. He definitely earned it with all of his recent world records. There is no one more deserving of The WMA Male Athlete of the Year that I can think of than Charles. He might not know this but I have always referred to him as the Energizer Bunny. He is capable of running all his heats at near record level performance. Great conditioning. Wonderful individual. Congratulations! Congratulations Charles and Christa. Charles you are without a doubt one of the fiercest competitors in our sport and definitely one the greatest. But, you are a greater person than you are an athlete. Your humility is unmatched and believe me when I tell you; you inspire and fire up many of us. Continued health and success to you. There is no more deserving recipient of this honor than you. As a Houston Elite teammate and professional colleague, I have had the privilege of knowing you, training with you, and handing you the baton. You have always been humble about your accomplishments and selfless in the way you put others’ needs ahead of yours. Congratulations, and see you in Boston! Charlie…….. I have competed against you and run with you on relays, and I never cease to be astonished with your athletic ability and humility. You are so deserving of this award, and my only question is why did they wait so long to choose you for this honor? You are the absolute Gold Standard in our sport.. It has been an honor to be on the same track with you. All the best to you, and I can’t wait to see a picture of you with your award in Monaco, flashing that beautiful smile. Congrats from all of us in Masters Track and Field..
What a great honor for such a great athlete and person. It is a pleasure to know you and be a part of the same team, Houston Elite. You have always graciously acknowledged lesser athletes such as myself by knowing us by name. Congratulations!!! Charles and Christa- two of the all-time greats-I salute you both. I send special congratulations to you Charlie because I have the honor of being your friend and teammate. There is no finer runner and person than you. A wonderful honor for a great athlete and gentleman!! Congratulations Charles and Christa. Charles if you could bottle YOU !!!!! I’d buy it !!! Someone I look up to and appreciate your friendship. Christa I enjoyed watching your competitiveness. Charles and Crista are both very worthy. Charles you are one of my 3 favorite athletes in all of Masters Track & Field. That’s saying a lot because I know so many. I wish you continued success and health- enjoy the Gala event ! Congrats to Mr. Allie! Well deserved. Enjoy! Iam 53 years old and i have just started to compete again after over 30 years and it is very hard to run really fast again to run that fast at 65 is remarkable .You guys are really special congrats Mr.Allie.